You may be using a lot of different hair care products for straightening, moisturizing or bringing your hair back to life. However, somehow you never get the results you desire. This is because of the low quality and less significance of the formula involved in the manufacture of products. When you go for an expert or hair care specialist, he may recommend you to wash your hairs less frequently or just stay away from hair styling tools. This is certainly unacceptable for the fashion enthusiasts and thus, there is a dire need of such products that can get you healthy and clean hair. Different companies like Etae have emerged in the industry to manufacture and supply such hair care products that can refresh your hair. Etae hair product reviews show that the customers have highly benefited from the products and have got amazing results. Dry, lifeless hairs are not at all a problem anymore. E’Tae is one of the best manufacturers of hair care products. Owned by Kisha Tompkins Hudson, the company is created in order to help the teenage girls and women to get access to the best hair care products which are totally natural. Using E’tae natural products, you will have minimal risks of any side effects and maximum chances of getting growing, beautiful and healthy, full of life hairs. E’tae has been successful in satisfying the customers with its high- quality products so far. There are a wide range of products that cater to the nourishment of your hairs from every aspect. Get along and try these products to see if they can work for you too. The initiative behind this company is really impressive and so are the stats. People have found to get satisfied with these products, which surely seem to be a possible solution to different hair problems. Natural hair care product selection is really crucial since you have to take into account a lot of aspects including the manufacturer reliability, genuine product guarantee, allergy possibility from any of the ingredients and the reviews of different people. For a natural newbie, it may be quite difficult to choose which natural product for hair care he or she should try. Moreover, with tons of natural product claims on the market, it becomes hard at times to decide on one and buy it. You always have doubts in your mind thinking about which product is reliable and which one is buying. If your product selection is not based on a thorough research, then you are most likely to get into a false and junk product. Before you start figuring out the best hair care products, the first thing you need to know is your hair type and the type of product you want to get the most accurate results. Research on different available products that rank high according to the customer reviews and choose the best one for your particular hair issue. When I had to choose a product for my dull dry hairs, I had to assess more than 30 products, but I figured the best one out easily. It was from E’tae and the product they gave was my perfect match. For the people with dull lifeless hair, E’tae has a brilliant natural product for you that will bring them back to life. The product claims to bring you shiny, full of life hair. It is to be used with the regular shampoo and conditioner and it is recommended for all the hair types too. It worked great as far as my own experience is concerned. It gave amazing results providing me with smooth, silkier, shiny and soft hair. I received lots of compliments and it really felt good. Being natural, it is thought to work out well and bring your hairs to life. If you like to use natural products and want a solution for your falling hair that is shedding excessively and breaking a lot. Then, all you need to do is get this product and use it to get fuller, healthier and shinier hair. Use this product and see how your hair will be growing and getting full of life. Thicker hair that is shinier and long lasting straightened are certainly possible with this amazing product. Use it before shampooing. Keep the product at a regular room temperature and use it like you want to. However, the recommended frequent use of this product is once in a month. 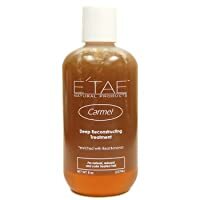 The sulfate free carmelux deep penetrating treatment shampoo by E’tae goes to the roots of your hair and increases their strength. The treatment formula incorporated in the product will perform any repairs if necessary. You can use the shampoo to cleanse your hair thoroughly and gently. If you feel that your hairs have lost shine and look lifeless, then you should try this product and try to bring their luster back. The formula claims to provide your hair with a natural shine. It can also maintain a healthy scalp. 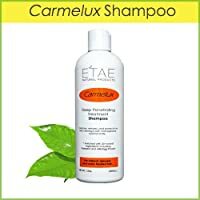 The Carmelux shampoo is known to possess high quality conditioning ingredients that are natural and protect and strengthen the hairs in the best way. The product can thus improve the texture and conditions of your hair. You can use the shampoo to balance the scalp and improve your hair growth by using it with some particular ingredients. People have got softer, shinier and strong hairs after using this product. All the ingredients are totally natural and thus ensure the minimal possibility of side effects. 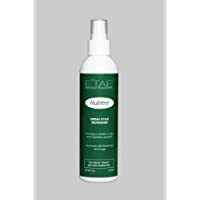 This is one of the bestselling products of E’tae that comes with an innovative formula that makes use of totally natural ingredients and provides high quality results. Silky, soft hairs are not a dream anymore because the E’tae Silk Protein Conditioner is a promising formula that reveals revolutionary results. This is what they claimed and let me tell you when I knew about this, I was really curious to try it and did so. Let me tell you that this is the most impressive hair care product that I have ever experienced. Right after using the product, it gave me instant soft hairs and a wonderful silky feeling. The product worked perfectly for me. It may be perfectly compatible with my hair and my hair type. It may or may not work for you. However, there is no harm in trying it as the product is completely natural. You will really get a treat in the form of this product if it works for you. Manage your hairs in a better way by using this product and detangle them easily too. Before rinsing, let the conditioner to sit in your hair and settle there for some amount of time. Now, you need to massage the conditioner throughout the hair while making it sure that all the strands are covered. Now, you may detangle your hair using a wide tooth comb while the conditioner rests in your hair. If you are using it as a leave in, then start with using the shampoo, then condition them and detangle them with a comb. Now rinse your hair and again apply a small quantity of conditioner to the hair. If you want to flat iron or blow dry your hair, then it is certainly not recommended that you keep the conditioner in your hair. E’tae is a company known for natural products. Thus, all the products have completely natural ingredients. Joining the series of E’tae hair care products comes the Nutrient Herbal Scalp Replenisher 6oz. This product as the name implies, focuses on mainly the scalp nourishment and for that purpose, the most significant role is played by the PH. The herbal scalp replenisher revives the PH balance of the scalp restoring it to its healthy and natural position. The natural shine of scalp and ultimately the hair is also increased while there is a significant decrease in the itchiness, dandruff and flakiness of the hair. Using this product will literally feel like soothing and cooling down the scalp. Infusing the nutrient herbal scalp replenisher with basil, sage and rosemary will help to regain the scalp’s PH balance soon and shall remove the buildup. This will result in silky vibrant hairs. The anti- bacterial properties of Nutrient Herbal Scalp help reduce the itchiness and dandruff within the scalp and thus leaving a beautiful refreshing feeling. The pores will be cleaner and pure that ease the way for the healthier hair to grow. Searching for a hair gloss? E’tae has got a deep moisturizing hair gloss light in weight that is composed of completely natural ingredients. These natural ingredients will give you a peace of mind while reducing the risk of side effects. Dry hairs are no less than a curse. With dry harsh hair, you always feel like you should get them short and feel underconfident assuming that you are lacking at the appearance part. Soft manageable hairs are more like a dream. I can relate this to my own story as there was a time when I tried every possible dry hair solution on my daughter’s hairs but could never get the desired results. I wished to have a natural product but was always stuck with fake and unreliable products. There was even no hope left to see my daughter with shiny silky hair which would be easy to manage. However, I came to know about this E’tae company from my friend that they formulate natural hair care products. I immediately looked for the hair gloss and purchased it. Within a few weeks, I started getting the stunning results as claimed by the company. I applied it on my hairs as well. Both I and my daughter were having gorgeous hair and everybody noticed it and complimented both of us too. So, the bottom line is that the product has worked for me. It has proven to be an exceptional one and better than many. It may or may not work for you depending on your hair type and many other aspects but giving it a try would be really good idea. Now, looking at the expertise and quality of E’tae, a person can surely assess their caliber. E’tae has continued to provide customers with durable and easy to use products. The products have been made from totally natural ingredients and it is the best part about Etae because you have to take minimal care about side effects and even if you don’t want to use it regularly, you can at least try it once to check out the effect on your hairs. E’tae has taken the hair care industry by storm and there is a reason for this. Customers want natural products that produce results. E’tae guarantees you results and manufactures completely natural products. Try one for yourself and get to know about the caliber of E’tae by yourself. You will surely like it. Get any one product and use it. See if it can bring the same results as claimed. And if you are happy with the results, then resort to E’tae for your complete hair care requirements. If you want to complete the whole bunch of E’tae’s products, then you can get a combo deal that will cost you less than the sum of individual products. Rather, this deal is highly recommended for you if you want the whole set. You can just click here and get this deal to reserve a complete set of hair care products by E’tae that comes at a great price. Hair care is a very important element in order to appear as an appealing personality. And the choice of hair care products is even more crucial as you have to be cent percent sure of the reliability and side effects. You cannot compromise your health at any cost. E’tae realizes this and has come up with natural products to provide the customers with a safe path. It has tried its best to incorporate natural ingredients and minimize any kind of health risks associated with the products or ingredients. Will I lose my curls by using these products? There is no such effect associated with the usage of any of the products of E’tae. Is Carmelux deep reconstructing treatment product used just to straighten the hair so that we can flat iron them? Not really. The deep reconstructing treatment is a natural product and is used for straightening hair or as a conditioning product. It keeps the hair moisturized. However, it is a natural product and you may use it for flat iron or just treat and cleanse the hair. Is the carmelux deep reconstructing treatment product easy to use? The directions are written in this article as well as on the back of the bottle. The product is really simple to use and doesn’t involve any sort of complexities. E’tae recommends you to leave the product on your hairs for at least about 20 minutes. Are the E’tae products durable? The durability of products can be best assured by the customers themselves. Use the product and see if the product is durable or not. It is completely natural so there is no harm in using the product. You can also check out the experience of other people related to the usage of E’tae products and read their reviews. Are there any sort of side effects involved with the usage of these products? There are absolutely no side effects and E’tae assures that. The manufacturing of these products has involved completely natural products and the sole reason to do so was to remove the risk of side effects. So, we come to know that the natural care of hairs doesn’t necessarily mean washing them less often and forbid ourselves from the use of styling tools. There are certain products that are completely natural and provide ultimate hair care. The products are associated with the minimal risk of side effects and it is actually an aspect that gives E’tae an edge over its competitors. Customers are always worried about the risk of side effects as they have received in the past. So, there is always a doubt in mind regarding usage of any skin care product. E’tae has managed to keep the customers calm and reduced the risk of side effects by incorporating natural products. The products by E’tae are known to restore the scalp to its original condition which nourishes the hair and the natural hair oils start making the hairs look shinier. The traditional shampoos that were being used greatly stripped the hairs from shine and moisture. No need to worry about any such element with E’tae. It will not only increase the shine of the hair but also the strength. The ingredients are known to thicken the hair strands and make their roots stronger. So, with E’tae you are going to have an ultimate solution for all your hair care requirements. So, why not make use of these products and start caring for the hair in a real manner. Stop using dangerous products that are harming your hairs, making them lose their shine and strength and resulting in their breakage. E’tae is the company that produces the real hair care products which are meant to literally care for the hairs and not destroy them. Natural products and ingredients are the best choices if you want to bring the natural silk, shine and luster to your hairs. For this purpose, going for a product that involves artificial ingredients is insane. You can never achieve that level of satisfaction with an artificial product that is meant to be a natural one. In this case, E’tae comes out to be a very good option. There may be many other companies who make use of the natural ingredients in their products. 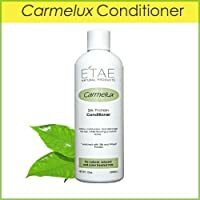 If you want to do more research and go ahead, check out their reviews and compare with my Etae hair product reviews. I had done mine and chose E’tae in the end. Trying the product for the first time. Had a hard time getting all the shampoo out, especially the root and scalp area..any ideas?! The shampoo is gentle so it’s best to let it sit for a few minutes to help dissolve oil build up. The product is made only for taking care of the hair. It is made from bananas, honey, olive oil and some other lots of ingredients.The product helps to create natural shine hairs. It is the most attractive feature of the product.For this special feature, the product is famous than the other products. I’ve used this product several times. I followed the instructions to the letter. I never achieved the same results shown in their video. I chalked it up to wasted money on a product that leaves tons of buildup in my hair. Also, I noticed that the Caramel Deep Reconstructing Treatment started to crystalize over time (like cheap honey from Walmart). I decided to stop using the product. Then one day after shampooing my hair with a clarifying shampoo from Zurish.com and applying a deep conditioning treatment to my hair, I decided to use the Buttershine as a heat protectant and Vuola! I got the results that I was looking for!!! And it only took ONE PASS with the flat iron. Using the buttershine on top of all of the etae products did not work for me. But using the buttershine on it’s own worked wonders for me. in my opinion, the Buttershine is the only product worth buying for my hair type. I used it for the first time 5 days ago. I love it! My hair was dry, thinning and completely lifeless. Since using these products my hair is back to it’s old self. It has movement, manageability and feels great. 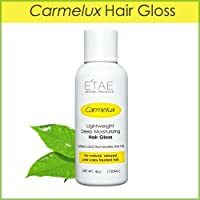 How often can I use Etae products? I like to do my hair every two weeks. Wondering if Two weeks are too much. I have this same question. If it is protein driven and too much protein can hurt you in the long run so how often. I was using it every week. My hair is fine and I notice some is missing in the back, so I stopped and went to once a month. I used these products and my hair started to fall out. Im currently transitioning and I honestly think its the Vinegar in the products that gave me these bad side effects. It may work wonderful on Natural hair. But, its very stripping on relaxed & transitioning hair. I am also transitioning. I used it because I didn’t want to perm my hair and it also was thinning out. Well it did make it soft and bouncy and straights as ever. I began using every week. About 3 weeks later I noticed the back of my hair had fallen out. No I didn’t flat iron it at all because it was thin and it is fine. I’m now using once a month due to I see protein is in everything. I only been transitioning(last perm) since November 2017. Any suggestions.